Фредди Меркьюри (ингл. Freddie Mercury, ысын исеме — Фаррох Булсара (гуджарати ફારોખ બલસારા); 5 сентябрь 1946, Занзибар солтанаты — 24 ноябрь 1991, Лондон, Бөйөк Британия) — британ музыканты, Queen төркөмдөң вокалисты; «Bohemian Rhapsody», «Don’t Stop Me Now», «Crazy Little Thing Called Love» һәм башҡа йырҙар авторы. Ул Rolling Stone журналының «100 иң бөйөк йырсылар» исемлегендә 18-се урында тора. Фаррох Булсара Занзибар солтанатына 5 сентябрендә 1946 йылда тыуған. Уның ата-әсәләр британ һиндтар булған. Lover of Life, Singer of Songs (2006). ↑ 100 Greatest Singers (инг.). Rolling Stone (2 декабрь 2010). 1 сентябрь 2015 тикшерелгән. ABC Television (20 August 2007), «Freddie Mercury: The Tribute Concert», Sydney: Australian Broadcasting Corporation, <http://www.abc.net.au/tv/guide/abc2/200708/programs/ZY9027A001D20082007T210000.htm> . Aledort, And (29 November 2003), «Guitar Tacet for Queen's Bohemian Rhapsody», <http://people.csail.mit.edu/custo/FTP/Chitarra/Bohemian%20rhapsody%20-QUEEN.txt> . 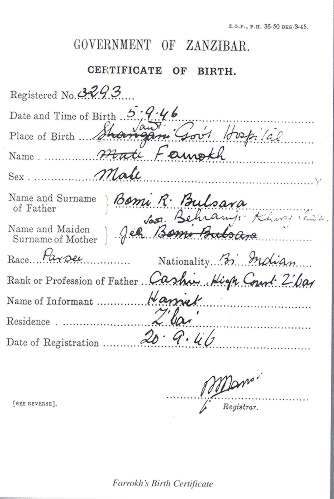 "Linda B" (2000), «Certificate of Birth», Chorley: mr-mercury.co.uk, <http://mr-mercury.co.uk/Images/Birthcertificatefreddie.jpg> . BBC News (22 August 2002), «BBC reveals 100 great British heroes», London: BBC News, <http://news.bbc.co.uk/2/hi/entertainment/2208532.stm>. Проверено 4 ғинуар 2010. .
BBC News (4 July 2005), «Queen top UK album charts league», London: BBC News, <http://news.bbc.co.uk/1/hi/entertainment/music/4648611.stm>. Проверено 4 ғинуар 2010. .
BBC News (9 November 2005), «Queen win greatest live gig poll», London: BBC News, <http://news.bbc.co.uk/1/hi/entertainment/music/4420308.stm>. Проверено 4 ғинуар 2010. .
BBC News (1 September 2006), «Zanzibar angry over Mercury bash», London: BBC News, <http://news.bbc.co.uk/2/hi/africa/5306792.stm>. Проверено 4 ғинуар 2010. . Biography Channel (2007), «Freddie Mercury», London: thebiographychannel.co.uk, <http://www.thebiographychannel.co.uk/biography_story/338:294/1/Freddie_Mercury.htm> . Boyce, Simon (1995), «Freddie Mercury», Bristol: Parragon, ISBN 1-86105-054-2 . BBC News (8 October 2007), «Queen's rhapsody voted best video», BBC News, <http://news.bbc.co.uk/2/hi/entertainment/7033249.stm>. Проверено 4 ғинуар 2010. .
Blaikie, Thomas (7 December 1996), "«Camping at High Altitude»", The Spectator, <http://findarticles.com/p/articles/mi_qa3724/is_199612/ai_n8756422> . Bradley, J. (20 July 1992), "«Mercury soars in opera CD: Bizarre album may be cult classic»", The Denver Post (Denver: MNG) . Bret, David (1996), «Living On the Edge: The Freddie Mercury Story», London: Robson Books, ISBN 1-86105-256-1 . Brown, G. (19 April 1992), "«Queen's popularity takes ironic turn»", The Denver Post (Denver: MNG) . Brown, Mark (16 November 2006), "«Queen are the champions in all-time album sales chart»", The Guardian (London), <http://music.guardian.co.uk/news/story/0,,1948792,00.html> . Cain, Matthew, dir. (2006), «Freddie Mercury: A Kind of Magic», London: British Film Institute, <http://www.youtube.com/watch?v=AQ1cfoMWRpQ> ..
Clarke, Ross (1991), «Freddie Mercury: A Kind of Magic», Oxted: Kingsfleet Publications, ISBN 1-874130-01-9 . CNN (9 May 2002), «Queen in Rhapsody over hit award», Atlanta: CNN, <http://archives.cnn.com/2002/SHOWBIZ/Music/05/08/uk.queen/index.html> . Cohen, Scott (April 1975), "«Queen's Freddie Mercury Shopping for an Image in London»", Circus Magazine, <http://www.queenarchives.com/viewtopic.php?t=30>. Проверено 24 сентябрь 2009. .
Coleman, Ray, ed. (2 May 1981), "«The Man Who Would Be Queen»", Melody Maker, <http://queenarchives.com/viewtopic.php?t=26>. Проверено 24 сентябрь 2009. .
Cota, Erich Adolfo Moncada (25 January 2006), "«Queen Proves There's Life After Freddie»", Ohmynews.com (Seoul), <http://english.ohmynews.com/articleview/article_view.asp?article_class=6&no=270701&rel_no=1> . D'Esti Miller, Sarah (19 July 2007), "«EPAC's 'Rhapsody' Hits Too Many Wrong Notes»", Press & Sun-Bulletin (Binghamton, NY), <http://www.queenzone.com/news/epacs-rhapsody-hits-too-many-wrong-notes.aspx>. Проверено 24 сентябрь 2009. .
Das, Lina (2006), "«The Great Pretender»", The Mail on Sunday (London), 26 November 2000, <http://www.queenarchives.com/index.php?title=Freddie_Mercury_-_11-26-2000_-_Mail_on_Sunday>. Проверено 24 сентябрь 2009. .
Davis, Andy (1996), "«Queen Before Queen»", Record Collector Magazine Т. 3 (199), <http://www.freddie.ru/e/archives/qbq/1.html> . Evans, David & Minns, David (1992), «Freddie Mercury: This is the Real Life», London: Britannia, ISBN 0-9519937-3-9 . Freestone, Peter (1998), «Mister Mercury», London: Tusitala, ISBN 0-9533341-0-4 . Freestone, Peter (1999), «Freddie Mercury: An Intimate Memoir By the Man Who Knew Him Best», London: Omnibus Press, ISBN 0-7119-8674-6 . Gunn, Jacky & Jenkins, Jim (1992), «Queen: As It Began», London: Sidgwick & Jackson, ISBN 0-330-33259-7 . Haines, Lester (29 September 2005), «We Are the Champions" voted world's fave song», London: theregister.co.uk, <http://www.theregister.co.uk/2005/09/29/world_music_poll/> . Harris, John (14 January 2005), "«The Sins of St. Freddie»", Guardian on Friday (London), <http://arts.guardian.co.uk/harris/story/0,,1411006,00.html> . Hauptfuhrer, Fred (5 December 1977), "«For A Song: The Mercury that's rising in rock is Freddie the satiny seductor of Queen»", People Magazine, <http://www.queenarchives.com/index.php?title=Group_-_12-05-1977_-_People>. Проверено 24 сентябрь 2009. .
Highleyman, Liz (9 September 2005), "«Who was Freddie Mercury?»", Seattle Gay News Т. 33 (36), <http://www.sgn.org/sgnnews36/page20.cfm> . Hodkinson, Mark (2004), «Queen: The Early Years», London: Omnibus Press, ISBN 1-84449-012-2 . Hutton, Jim & Waspshott, Tim (1994), «Mercury and Me», London: Bloomsbury, ISBN 0-7475-1922-6 . Hutton, Jim (22 October 1994), "«Freddie and Jim" A Love Story»", The Guardian, "Weekend magazine", <http://queen.peoples.ru/html/archive/stati/fred_jim3.htm> . Hyder, Rehan (2004), «Brimful of Asia: Negotiating Ethnicity on the UK Music Scene», Ashgate, ISBN 978-0-7546-4064-6, <http://books.google.com/?id=54U93KEMlNwC&pg=PA75&lpg=PA75&dq=freddie+mercury+brim+of+asia> . Independent (December 2006), «Depp tipped for Freddie Mercury film role», UK, <http://www.independent.co.uk/arts-entertainment/films/news/depp-tipped-for-freddie-mercury-film-role-429639.html>. Проверено 25 февраль 2011. .
Jackson, Laura (1997), «Mercury: The King of Queen», London: Smith Gryphon, ISBN 1-85685-132-X . "James" (1 April 2007), «NTV program review: History's 100 Most Influential People: Hero Edition», Saitama: japanprobe.com, <http://www.japanprobe.com/?p=1471> . Januszczak, Waldemar (17 November 1996), "«Star of India»", The Sunday Times (London), <http://queenarchives.com/index.php?title=Freddie_Mercury_-_11-17-1996_-_Sunday_Times> . Jones, Lesley-Ann (1998), «Freddie Mercury: The Definitive Biography», London: Coronet, ISBN 978-0-340-67209-9, <http://books.google.com/?id=FN20GwAACAAJ&dq=lesley-ann+jones> . Jones, Tim (July 1999), "«How Great Thou Art, King Freddie»", Record Collector, <http://www.geocities.com/SunsetStrip/Stadium/5025/RC.html> . Landesman, Cosmo (10 September 2006), "«Freddie, a Very Private Rock Star»", The Sunday Times (London), <http://www.timesonline.co.uk/tol/news/article634052.ece>. Проверено 2 май 2010. .
Longfellow, Matthew, dir. (21 March 2006), «Classic Albums: Queen: The Making of "A Night at the Opera», Aldershot: Eagle Rock Entertainment . Hudson, Jeffrey (1995), «Freddie Mercury & Queen», Chessington, Surrey: Castle Communications, ISBN 1-86074-040-5 . Mercury, Freddie; Brooks, Greg & Lupton, Simon (2006), «Freddie Mercury: A life, In His Own Words», London: Mercury Songs, ISBN 0-9553758-0-0 . Minchin, Ryan, dir. (2005), «The World's Greatest Gigs», London: Initial Film & Television, <http://www.youtube.com/watch?v=Ob5NpdkH5Dw> . Myers, Paul (25 November 1991), "«Queen star dies after Aids statement»", The Guardian (London), <http://www.guardian.co.uk/fromthearchive/story/0,12269,1650611,00.html?=rss>. Проверено 2 май 2010. .
National AIDS Trust (2006), «25 years of HIV – a UK perspective», London: National AIDS Trust press office, <http://www.worldaidsday.org/about3.asp> . O'Donnell, Lisa (7 July 2005), "«Freddie Mercury, WSSU professor were boyhood friends in India, Zanzibar»", RelishNow!, <http://www.journalnow.com/servlet/Satellite?pagename=WSJ/MGArticle/WSJ_RelishArticle&c=MGArticle&cid=1031783665319&path=!entertainment!music&s=1037645508978>. Проверено 24 сентябрь 2009. .
Queen (1992), "Bohemian Rhapsody", «Queen: Greatest Hits: Off the Record», Eastbourne/Hastings: Barnes Music Engraving, ISBN 0-86359-950-8 . Plekhanov, Sergey (2004), «A Reformer on the Throne: Sultan Qaboos Bin Said Al Said», Trident Press Ltd, ISBN 1-900724-70-7, <http://books.google.com/?id=-U8BL-tEPLwC> . Prato, Greg (<not dated>), [Фредди Меркьюри (инг.) AllMusic сайтында «Freddie Mercury»], Ann Arbor: allmusic.com, <Фредди Меркьюри (инг.) AllMusic сайтында> . Rees, Dafydd & Crampton, Luke (1999), Summers, David, ed., «The Rock Stars Encyclopedia», London: Dorling Kindersley . Ressner, Jeffry (9 January 1992), "«Queen singer is rock's first major AIDS casualty»", Rolling Stone Magazine Т. 621, <http://queenzone.com/queenzone/article_show.aspx?q=96> . RIAA (2007), «Gold and Platinum Record Database», Washington: Recording Industry Association of America, <http://www.riaa.com/goldandplatinumdata.php?table=SEARCH> . Rivadavia, Eduardo (<not dated>), [Фредди Меркьюри (инг.) AllMusic сайтында «Mr. Bad Guy (Overview)»], Ann Arbor: Allmusic, <Фредди Меркьюри (инг.) AllMusic сайтында> . Rush, Don (1977a), "«Queen's Freddie Mercury»", Circus Magazine, 17 March 1977, <http://www.geocities.com/SunsetStrip/Stadium/5025/CIRCUS.html> . Rush, Don (1977b), "«title unknown»", Circus Magazine, 5 December 1977, <http://www.queenarchives.com/viewtopic.php?t=32>. Проверено 24 сентябрь 2009. .
Russell, Paul (2002), «The Gay 100: A Ranking of the Most Influential Gay Men and Lesbians, Past and Present», Seacaucus: Kensington/Citadel, ISBN 0-7582-0100-1 . Skala, Martin (2006), «Concertography > Freddie Mercury live > Early days», Plzen, Czech Republic: queenconcerts.com, <http://www.queenconcerts.com/live/freddie-mercury/early.html> . Sky, Rick (1992), «The Show Must Go On», London: Fontana, ISBN 978-0-00-637843-3 . Taraporevala, Sooni (2004), «Parsis: The Zoroastrians of India: A Photographic Journey» (2nd ed. ), Woodstock/New York: Overlook Press, ISBN 1-58567-593-8 . Teckman, Kate, dir. (2004), «Freddie's Loves», London: North One Television *part 2* *part 3*. Teeman, Tim (7 September 2006), "«I Couldn't Bear to See Freddie Wasting Away»", TheTimes (London), <http://www.timesonline.co.uk/tol/life_and_style/article630033.ece>. Проверено 2 май 2010. .
Urban, Robert (<not dated>), «Freddie Mercury & Queen: Past, Present & Future Impressions», afterelton.com, <http://www.raggedblade.com/reviews/000329.html> . WENN (9 April 2005), "«Legend Freddie Mercury Honoured»", Femalefirst.co.uk (Wigan, Lancs), <http://www.femalefirst.co.uk/entertainment/Freddie+Mercury-3960.html> . Wenner, Jann (2001), "Queen", «Hall of Fame Inductees», Cleveland: Rock and Roll Hall of Fame . Wigg, David (22 January 2000), "«Mercury Left Me His Millions»", Daily Mail Weekend, <http://www.freddie.ru/e/archives/daily_mail/> . Gunn, Jacky; Jenkins, Jim. Queen: As It Began — London: Hyperion Books (Adult Trd Pap), 1994. — 292 p. — ISBN 978-0786880034..
St. Michael, Mick. Queen in Their Own Words — London: Omnibus Press, 1994. — P. 86, 87. — 112 p. — ISBN 978-0711930148..
Фристоун П. Фредди Меркьюри. Show Must Go On — Екатеринбург: У-Фактория, 2005. — Б. 341. — 352 б. — ISBN 5-9709-0130-X..
Был бит һуңғы тапҡыр 19:37 8 декабрь 2018 үҙгәртелгән.